The King's University located in Edmonton, Alberta, Canada, is a top private Christian university offering bachelor's degrees in the arts, humanities, music, social sciences, natural sciences and commerce/management, as well as an education after degree. The King's University is a member of Universities Canada and the Council for Christian Colleges & Universities (CCCU). The Environmental Studies (ENVS) program combines a major in ENVS with a concentration in one area of three, Social Sciences (BA), the Humanities (BA) or the Natural Sciences (B.Sc.). Students can concentrate their studies in one of the following areas: Biology, Business Administration, Chemistry, Computing Science, English, Philosophy, Politics and Economics, Psychology, Sociology, Social Sciences or Theology. Interdisciplinary perspective and approaches are adopted in all ENVS courses and projects. 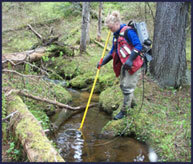 Students learn practical environmental skills, including mapping and aerial photo interpretation, Geographical Information System (GIS), Environmental Impact Assessment (EIA), statistics and other computer applications. They discover how the natural world works, and examine how humans interact and manage the environment, while developing an understanding of Christian Stewardship. This program includes a 13-week internship. Most notably, in 2011 The King’s Environmental Studies (ENVS) Program was granted professional accreditation from Environmental Careers Organization (ECO) Canada, the certifying body of the Canadian Environmental Accreditation Commission (CEAC). This Professional accreditation is in addition to the academic accreditation already granted by the Campus Alberta Quality Council. King’s was the first post-secondary institution in Canada to receive such professional recognition for an environmental studies program that includes BA and B.Sc. degrees.